One of the great feats of Wonder Woman was the amount of time and research costume designer Lindy Hemming put into the clothing worn by the Amazons: the group of warrior women Wonder Woman hails from. The women on Themyscira looked awesome in their armor, and one shudders to imagine what they might have looked like in the hands of a less imaginative costume designer. Actually, you don’t have to imagine at all, because it sure looks like Justice League decided to strip the Amazons down to something a bit more exploitive and titilating for its depiction of the Amazons. Yes, Justice League—with costumes designed by Michael Wilkinson, part of the movie’s all all-male creative team—is dressing the Amazons up in what amounts to leather bikinis, which have no precedent in historical culture and don’t seem like they’d be particularly functional in a combat situation. Wonder Woman began filming in 2015, the year before Justice League started filming in 2016. 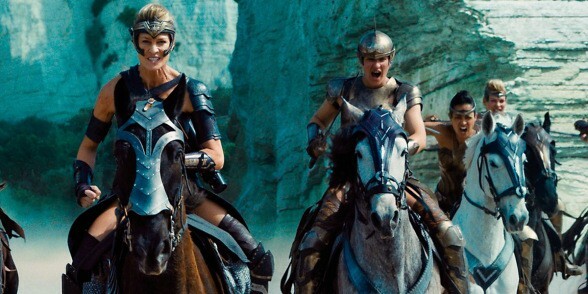 The Amazons’ design was finalized and most of the costumes completed while Justice League was still in pre-production. That means that there were discussions about what the Amazons should wear into battle in Justice League and the epic designs from Wonder Woman were rejected in favor of leather bikinis. Let that sink in. They rejected already finished costumes to redesign and remake the armor so that more skin would be showing. It’s possible that these early pictures don’t tell the whole story and perhaps Justice League‘s Amazon warriors do suit up in more sensible fashion at some point. But still, it’s an unfortunate look. Hopefully, future installments in this franchise will send its women into battle wearing something that makes sense for war.